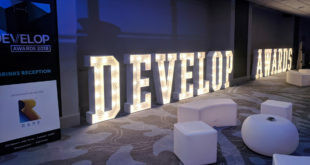 The Develop Awards return in July with some updated categories and an improved lobbying process. 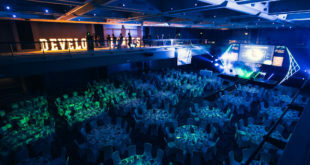 But some important elements have stayed the same – the hugely popular industry event returns to Brighton in July, and as usual will reward the best of the best in European games development. The event takes place on the evening of July 10th at the Brighton Hilton Metropole, during the Develop Conference 2013. To book your place now, contact Kathryn.Humphrey@intentmedia.co.uk. 20 awards are up for grabs, including favourites such as New IP, Independent Studio and Technical Innovation. The esteemed winner of our prestigious Development Legend award will also be announced ahead of the event. The full list of categories is printed below. This year we have updated the awards for creative outsourcing, with specific emphasis on what the games audio, CG and other creative businesses have offered to specific projects released during the eligibility period. A full lobbying guide will be posted online shortly and printed in the April issue of Develop. In the meantime, we have included a super-easy guide to lobbying at the bottom of this story. In short: you send suggestions to developlobbying@intentmedia.co.uk. The deadline for lobbying is 5pm on Tuesday, April 16th. After then the Develop team will vet the submissions, and the finalists will be announced in early May. The Develop Awards are supported by platinum sponsor Crytek, and gold sponsors include Ukie, Amiqus and Testronic Labs. OPM Recruitment is also table gift partner. How can my company enter? This one’s simple. Send us a short pitch (200 words), either as a Word document or plain text in an email body, explaining why you should be considered as a nominee. Please also supply a bullet point list of creative, commercial and/or technical accomplishments made by your business in the eligibility period. Note: text supplied will be used to judge your entry – and will be used to write finalists’ text should you be nominated. Plesae mark up any confidential stats or information you wish us to take into consideration but do not wish to make public-facing. Send all that to developlobbying@intentmedia.co.uk. Don’t forget tell us what awards you want to be considered for! You’re also actively invited to lobby for other companies across the games industry – be it publishing partners, your favourite services or outsourcing outfits, and the studios that you admire. Lobbying isn’t voting, so there is no need to get all of your partners to put your name forward without any detail. The deadline for lobbying is 5pm on Tuesday, April 16th. Please note that to be eligible the games in question must have been released somewhere in the world after May 1st, 2012 and by April 30th, 2013. That counts whether the game is a physical or digital release. Games in a commercial public beta are also eligible. Businesses must be based in Europe to be eligible – technology or services firms from outside Europe can lobbying for their relevant catagories provided they can prove worthwhile support or collaboration with studios in the region. Technology or services firms based in Europe that have worked on games developed outside of the region can also apply. So what’s the judging process? When all nominations are in, they are appraised by the Develop editorial team. The team then decides upon a shortlist for each award based on the lobbying documents and industry standing. Profiles of the shortlisted companies are then sent out to a judging panel made up of 100 industry executives hand-picked by the Develop team. The judges confidentially disclose their choices and those with the most votes win. Simple. The names of the judges are only named after the event.